Annika Rounds was born on February 14, 2012. At 7 weeks old, she started acting differently and every once in a while she would scream in pain. At 9 weeks old, she would vomit so much that she couldn’t be put down even for a second or she would throw up. Her belly became distended practically overnight, which prompted her parents to take her to the hospital. At the children's hospital, they noticed that her abdomen was hard so they did a scan immediately. The scans showed a mass in her abdomen. She soon had a surgery to biopsy the mass to see if it was cancerous and if so what type of cancer it was. Annika was diagnosed with Intermediate-Risk Neuroblastoma, cancer of the immature nerve cells, on April 27, 2012 when she was just 10 weeks old. Annika underwent surgery to remove as much of the tumor as possible. She had 4 rounds of chemo and was declared in remission. In December 2012, she had relapsed and the cancer was in her liver, growing along her spine, and in her bone marrow. She had 8 more round of chemo. After the chemo, she had another scan that showed that the tumors were still active. She went to New York in September 2013 where she underwent a very risky surgery to remove as much of the tumors as possible and 75% of her liver. She was expected to take 2 months to recover, but instead she recovered and was back home in 2 weeks. Next, she started several rounds of Accutane, a non-chemotherapeutic drug to help mature the Neuroblastoma cells quickly. After all the rounds of Accutane were over, she had a scan to determine how her cancer was responding. The scan still showed signs of cancer, but it was stable so they stopped all treatment and decided to watch her closely. She had scans every 3 months to check for growth/progression. In March 2015, shortly after her 3rd birthday, Annika’s scan showed that she had a new tumor growing. Her scan results were sent all over the U.S. trying to find the best place for her to have another surgery and to decide whether to try and remove both tumors or just the new one. Annika and her mom left for New York on April 6th and they decided to try and remove both of her tumors. Annika had her surgery on April 10th. During her surgery, 2 more tumors were found that could not be seen on the scan. Annika was playing in the playroom just 2 days after her surgery and less than a week after her surgery she was home. She soon started chemotherapy again. She had scans in July 2015 to see if the tumor had shrunk. They showed that the tumor was still there and they were unsure about the tumor that was found during the surgery. On October 14, 2015, Annika’s scan showed that she had relapsed for the third time and would be fighting cancer for the fourth time. The tumor had spread up her spine and into her shoulder. Because her cancer kept coming back, she was re-categorized as high-risk instead of intermediate-risk and would need more intense chemotherapy, radiation therapy, possibly a stem cell transplant, antibody therapy, and more Accutane. She had already had 6 rounds of Accutane and 16 rounds of chemotherapy before the 3rd relapse. She started chemotherapy again on November 5, 2015. On November 20, 2015, she had her stem cells harvested for 8 hours from a line placed in her neck. Annika had scans again in December to see how the cancer was responding to the chemo. It showed that the tumors were slightly smaller. On December 30, Annika started round 3 (17th total) round of chemo. 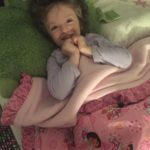 Annika was given every single anti-nausea medications that is available for her age (all 7!) because her nausea and vomiting from the chemo was so bad. She finished her very last dose of chemo, after a total of 17 rounds in her short almost 4 years, on January 3rd, 2016. Annika had scans again on January 26th and 27th that showed that Annika’s tumors were smaller. On March 8, 2016 Annika started radiation therapy. She had radiation 5 days a week for 4 weeks. Annika had her last day of radiation on April 5th after 20 days of radiation. On April 15th, Annika started cycle one of 6-month long antibody therapy. It is very painful, but it increases the survival rate by 20%. Over several weeks, Annika had many inter-muscular injections to build her immune system and then she would have infusions of antibodies, while inpatient, that will attach a molecule to all of the Neuroblastoma cells in her body. Her body will then see this molecule as foreign and, with her heightened immune system, her body will kill the cancer cells. Since the medications are not compatible, Annika had to have a PICC line placed for a few months to give them more access points than her port alone gave. Annika has now finished antibody therapy and is starting more rounds of Accutane to hopefully progress any remaining cancer cells.